Melania Wants "Hard Evidence" For Assault Claims - Joe.My.God. Melania Trump is calling on sexual misconduct accusers to produce “hard evidence” to back up their claims. 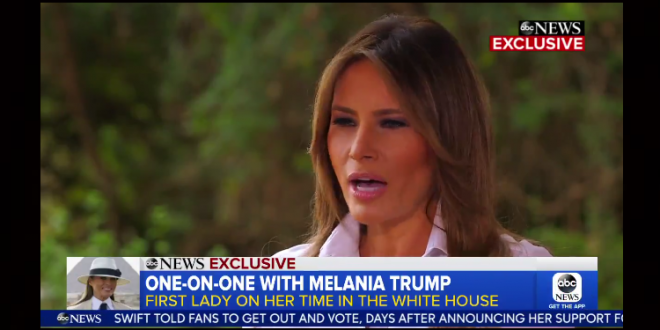 During an interview which was taped in Egypt last week as part of a one-hour special set to air Friday (which was previewed on Good Morning America Wednesday), ABC’s Tom Llamas asked the First Lady whether she believes “men in the news” who have been accused of sexual assault or sexual harassment have been treated unfairly. “We need to have really hard evidence that, if you are accused of something, show the evidence,” Trump said. Asked whether she supports the MeToo movement. Mrs. Trump said, “I support the women, and they need to be heard. We need to support them. And, you know, also men, not just women.” President Donald Trump, accused of sexual assault by numerous women over the years, has said it’s “a scary time” for men facing allegations from years ago, as with Brett Kavanaugh. Kavanaugh denied those, as has Trump. Melania Trump calling on sexual assault accusers to show “hard evidence” to back up their claims. Should women start wearing body cams?